What’s not to love about Thanksgiving? It’s got everything you could possibly want. Turkey! The food! The family!? Dessert! Football on TV! The cocktails!! More dessert! Uncle William and Aunt Susan arguing about whether or not the potatoes are better with or without lumps! In Louisiana, we do food holidays big! When you are arranging a gathering with family and friends, it’s best to have a plan. There are a lot of things to take into consideration to ensure a safe and happy Thanksgiving celebration. Around 50.9 million people traveled 50 miles or more in 2017 for Thanksgiving. 2018 is expected see similar numbers. That’s a lot of people on the roads and in the air. Plan ahead. Check for construction zones, accidents, police presence via Waze. Check the weather along your route. Drive safely. Be aware of your surroundings on the road. Secure your home before leaving. Ensure all windows and doors are locked. Set the lights inside your home on a timer. Have a trusted friend or neighbor check on your home while you are away. Don’t tell the internet that you are away from home. Food-borne illnesses as a result of inadequate cooking can put a quick end to Thanksgiving good times. Every year there are 76 million cases of foodborne illnesses in the United States. Thanksgiving is among the riskiest days of the year. But it doesn’t have to be that way. Defrost the turkey properly. Cook immediately after thawing. Never handle raw and cooked foods together. Avoid cross-contamination. Cook to a minimum 165 F° internal temperature. Use a thermometer. Consider cooking the stuffing and turkey separately. In 2016, fire departments in the United States responded to 1,570 home cooking fires on Thanksgiving day. 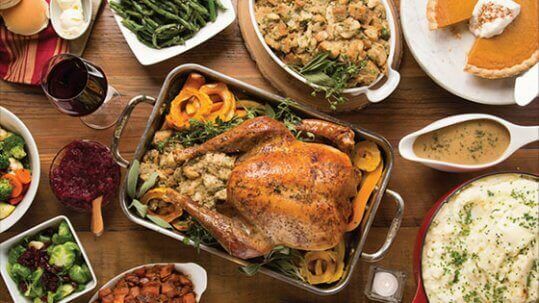 There are 3 times as many Thanksgiving cooking fires than on a typical Thursday. Hectic cooking schedules, and distractions of family and friends contributes to accidents. Don’t run to the store for last minute missing ingredients. Keep kids & pets away from the stove, oven, fryers & grills. Keep matches out of the reach of children. Make sure your smoke alarms are functioning. When frying, keep the fryer outside. Away from walls & ceilings. In a well ventilated area. It’s the holiday season. That means it is time for the 4 F’s. Family. Friends. Food. Feelings. Don’t let the stress ruin a time meant to be spent appreciating all the good things in your life. Ask for help. Don’t try to do everything alone. Make your brother-in-law earn his keep. Do as much as you can in advance. The more you do ahead of time, the less that needs doing day-of. Assigned seating? It may be the best way to keep your liberal cousin from upsetting your conservative grandmother. Set limits. Arranged arrival and departure times can ensure that Mom doesn’t think she’s hanging out indefinitely. You have no obligation to include toxic family members in your holiday plans. All of us at the Law Offices of L. Clayton Burgess hopes you have a safe and happy Thanksgiving! Don’t forget to register for your chance to win a pair of tickets to see the Christmas lights at Noel Acadien au Village. Click here for entry instructions. Winners will be announce the week after Thanksgiving.